This is a guest post from reader and friend of the blog, Shan L, He has also written about his new network experiences for the South, West, East and Central when those networks rolled out. 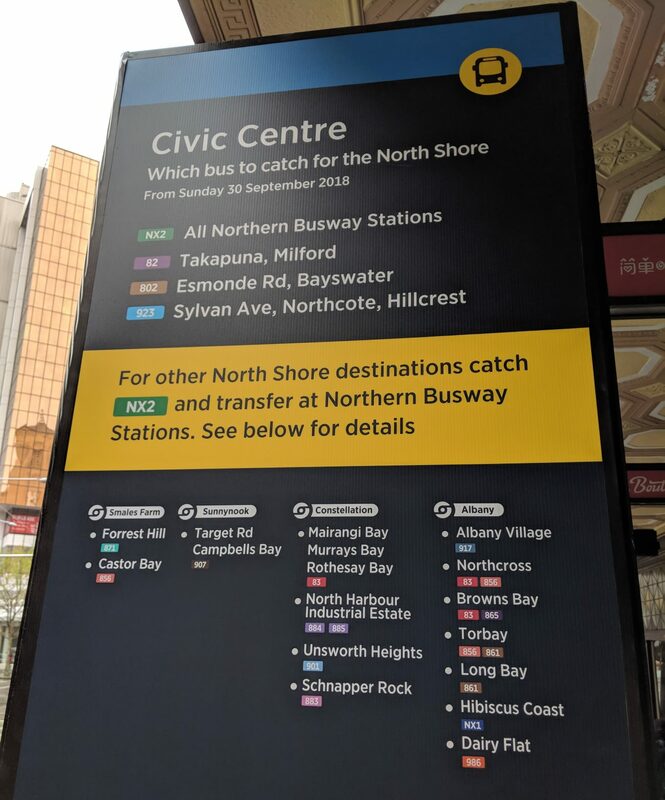 The go-live of the New Network for the North Shore happened on Sunday last month – the final major chunk of new network to go live since the south changed over almost two years ago. I took my usual ride around on launch morning to see how it went. 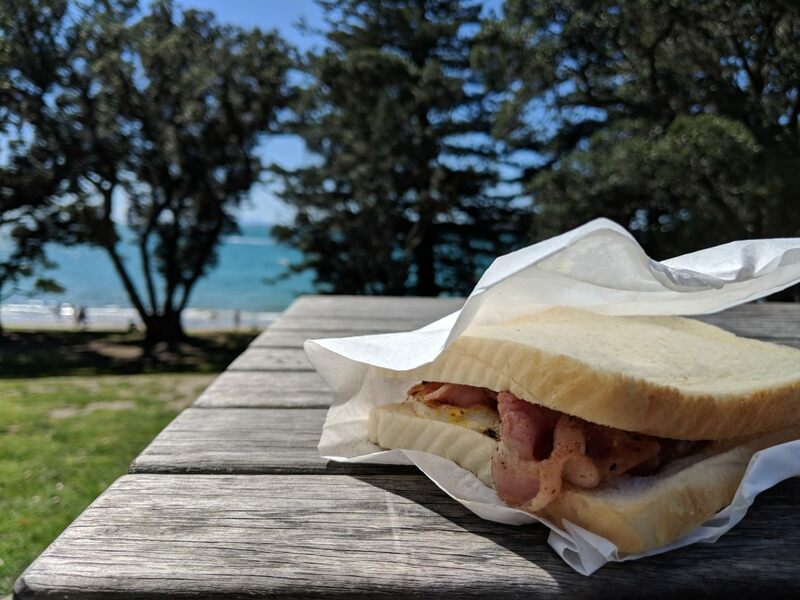 A few people suggested that I go up to Warkworth/Matakana, but instead I was extremely lazy. Technically not the shore network, but I’ve got to get there somehow, and the now always-frequent buses down Mt Eden Rd got me to mid town without any issue. 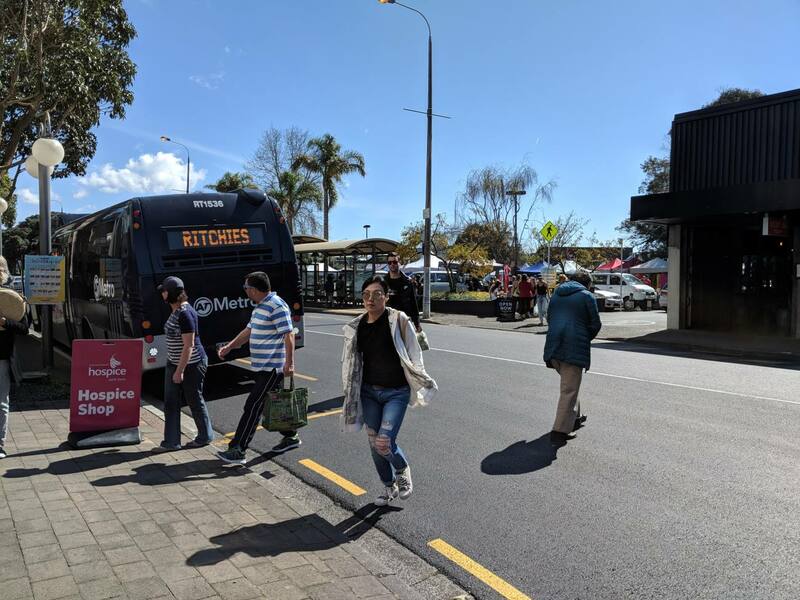 The most direct way to the shore from most of the isthmus – and in particular to Takapuna – is to take a bus from mid-town over the hill down Wellesley St. Previously there weren’t too many options available to actually do this, with only a few unevenly spaced services running at best every 5 minutes, and at worst every 15. But now with the new network the frequent NX2 and 82 run this route, along with a spattering of less frequent options. These combine to give good frequency from this part of town to the shore, although they still suffer from somewhat uneven spacing, which might be more of an issue if you’re using them to get across the CBD, rather than go to the shore. However, that’s a topic for another post. It’s a quick walk across Queen St to get to the connecting buses outside The Civic. 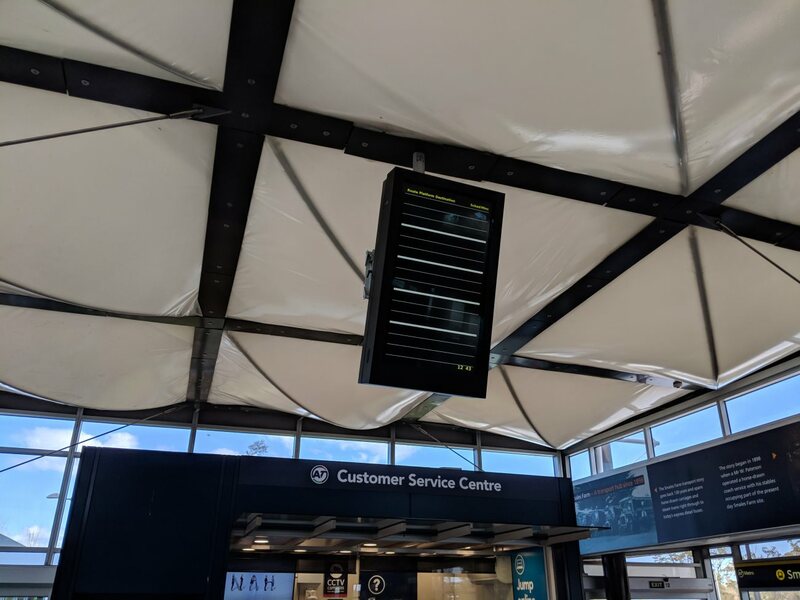 AT installed a large temporary looking monolith with some information about which services go where, and connecting services on the busway, in addition to the normal signage. I managed to get a (supersized!) network map from the AT guy who was stationed at the stop, and after an 8 minute wait I was on an 82 to Takapuna. 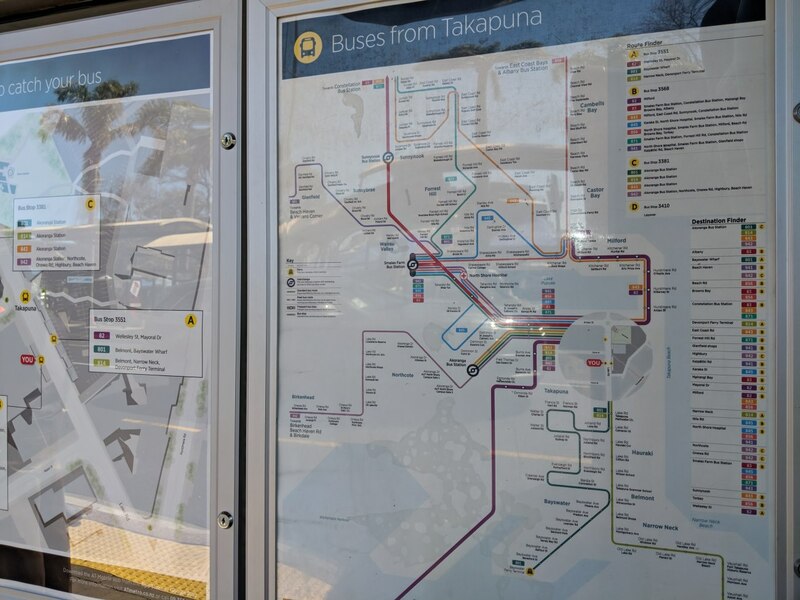 Although it didn’t affect this particular trip, looking at the map it seemed off that the 82 bypasses Akoranga Station – surely it would be far more useful to pass through it and allow connections to other busway services? 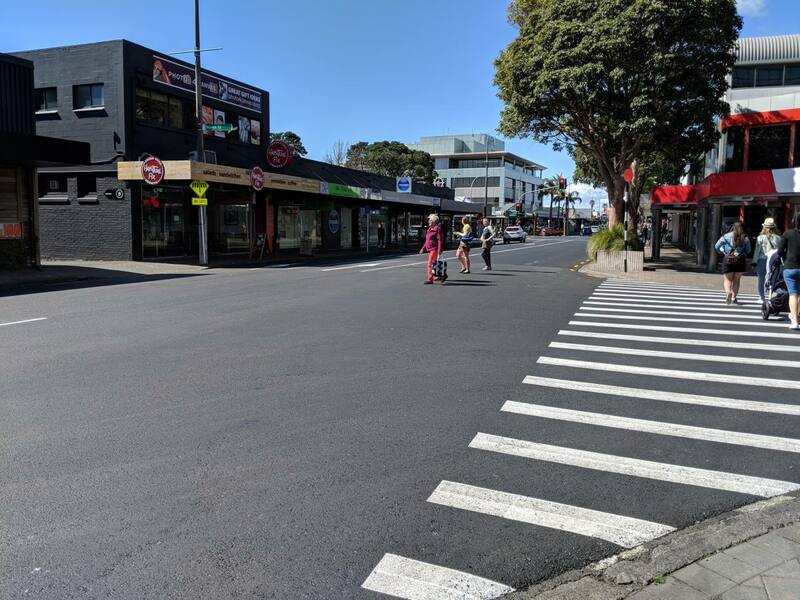 Arriving at Takapuna the first thing I noticed was the recently resurfaced sea of tarmac, with a steady stream of pedestrians trying to cross it – and exactly one pedestrian crossing. Why we’re still putting in this sort of infrastructure when we have the opportunity to make it safe and respectful to its users, I’m not sure. After locating some lunch by the beach, I made my way back through the various carparks and driveways to the same bus stop I arrived at. 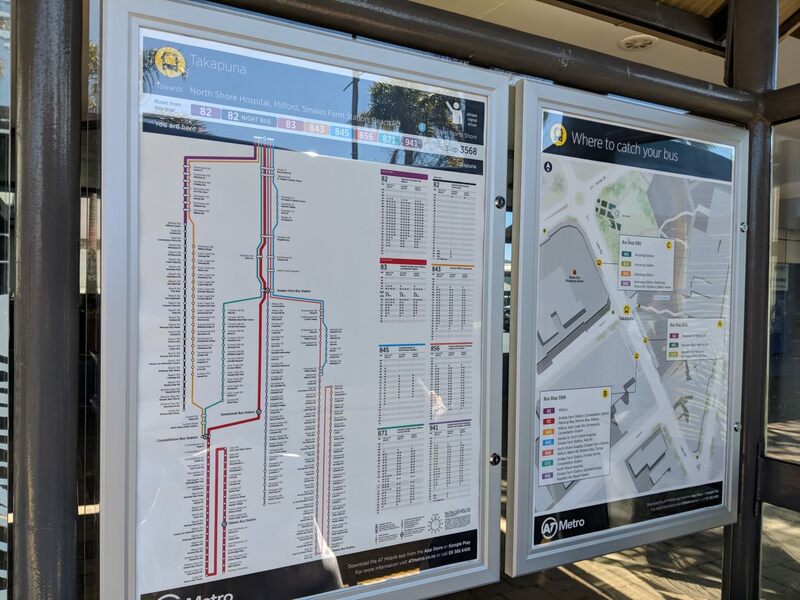 Most major bus stops are festooned with information about the available services – which is good – but I do often find that I have to lean in (often over people sitting down) and study intricate diagrams more than I’d prefer, just to get to correct platform. There are probably ways to guide people to the right stop with more bigger, clearer signage. I’ve only had one experience with a single door bus and it wasn’t great – it was busy and unpleasant to get in and out of. 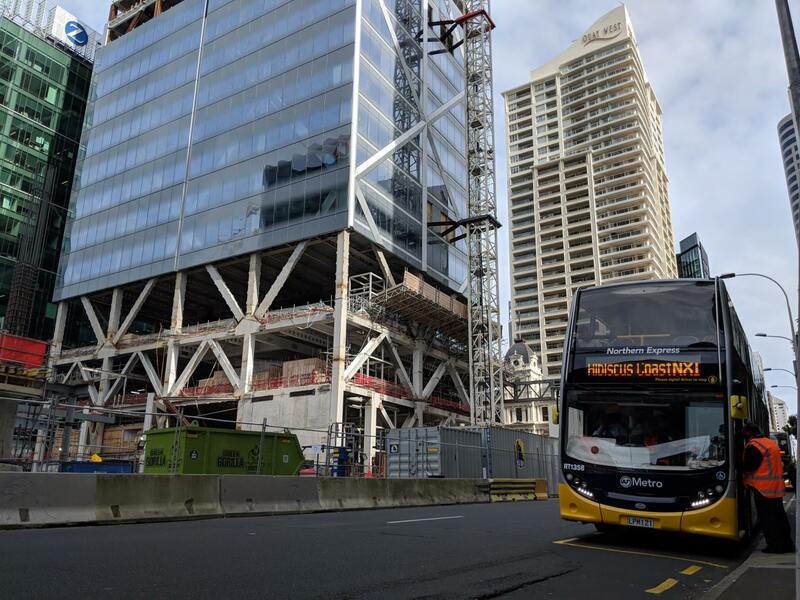 Hopefully this one will stay quiet – although it was running between Smales Farm and Takapuna which I’m assuming can be pretty heavily used. 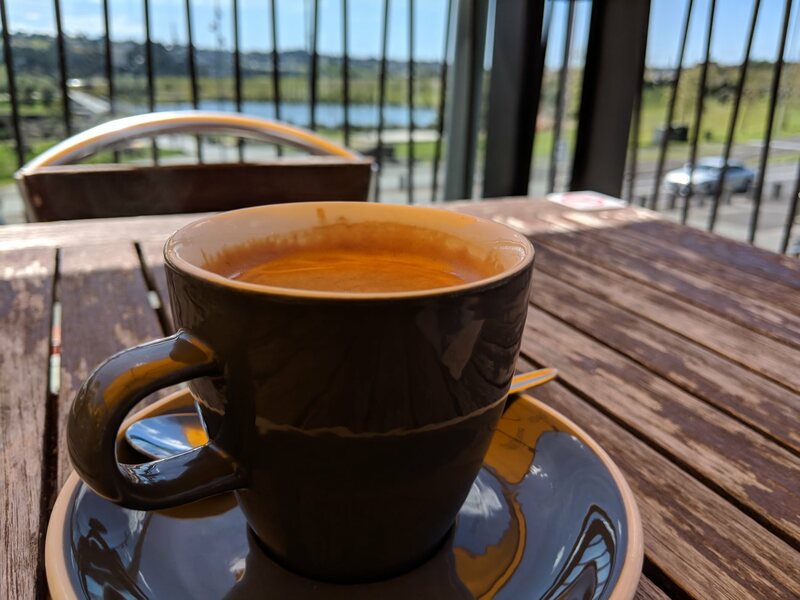 At Smales Farm I needed to change to a bus to Albany. The busway stations are pleasant places to transfer, but the wayfinding could do with some work. The realtime board was broken, and I had to go on a hunt to find out which stop to wait at. 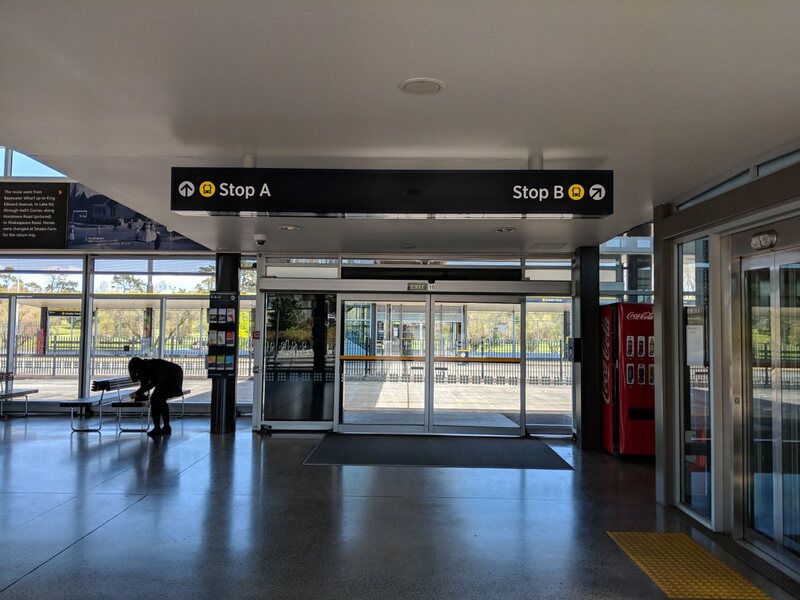 The wayfinding is OK at directing you to a particular stop, but it would be much easier for customers to be able to follow signs to named destinations and directions instead of having to look up stop numbers on a board. It feels more like a regional station where you have more time to see which platform your services is going to, than a metro-style one where you want to funnelled to the right place with as little thinking as possible. I ended up just wandering around various stops for a bit until I found one with buses in the Albany direction – a bit of a pain since you actually have to cross the busway to get to some of them, so not something you want to do unless you mean it. As a result I missed the next bus and had to wait 12 minutes for the subsequent one. At Albany I managed to catch an 83 to the mall without any trouble. Arriving at the beach on another 83, I sought out some classic confection for some very particular associates. Apparently I really like the 83 bus! This time there was a slight delay as an AT hi-vis helper very impressively sorted out a question a customer had for the driver, using a random passenger as a translator. Annoyingly, there is no frequency service connecting most of the western half of the shore with the busway, so I took an infrequent 95C down to Birkenhead. 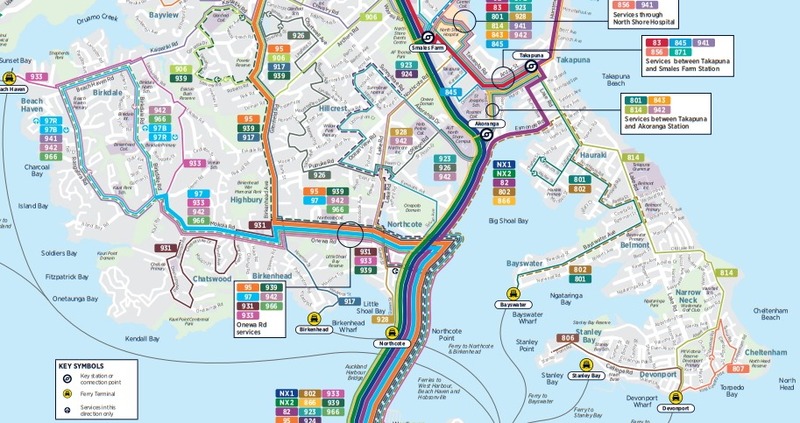 I was briefly confused by the way the 95C appears to split off into the 95B in the map, but eventually figured out that the 95B starts somewhere else just before it goes off on a diversion to Bayview (where it starts isn’t clear). It’s a pity that the 95 can’t make a frequent connection to Constellation. 18 minutes later, I was in Birkenhead and picked up the local speciality. I was considering going over to Devonport and taking the ferry back to the city, but without the ability to change at Onewa Rd (buses from the west only go south over the bridge!) and the lack of a frequent service down the peninsula to Devonport put me off. So after a brief wait I was back downtown. The first thing I noticed was how smoothly everything seemed to be running – AT have come a long way since the launch of the first, southern segment and people jumping out in front of buses going the wrong way trying to make them stop. Sure, this sort of thing probably still happened in places but the sense of absolute chaos dropped as each new part went live. The network itself handled most of what I attempted pretty well. But it does feel more commuter oriented than some of the other segments: there’s not as much in the way of well connected frequent crosstown routes and it still feels like there are little bits weirdness around the place. Perhaps this is due to the geography or the street network or something – I’m not sure. At the very least it seems like there’s a giant interchange shaped gap somewhere in the vicinity of Onewa Road. Now all the the new network segments are live it’ll be interesting to see how it evolves: there are some obvious things that need fixing like bus priority, route tweaks and train frequency. But from doing these rides it’s become obvious that there are number of low hanging fruit that could be picked more easily, like improving wayfinding, or simply letting people know that the network exists and how they can use it. Hopefully it doesn’t stay static and AT continue to improve it aggressively as time goes on. Truck break down on bridge. No car trip then, and the buses will likely also be heavily affected. Strill, it was a beautiful day and with a bit of planning I could still catch the ferry. Caught the train from Morningside to Britomart. Good – fast, reliable and cheap. The train seemed to connect perfectly with a stroll to catch the ferry to Devonport. Cost $4.80, WTF?? Is this pricing mean it is a tourist trap rather than an actual commuter service??? Devonport. Apparently there is a bus, the 814. First problem – when the ferry arrived, the 814 had already gone so there was a 20 minute odd wait. Second problem. The sign outside the terminal didn’t tell me where to stand to get the bus going in the right direction. A woman looking at her watch and then the next bus was using very colourful language to describe the frequency and timing of this bus. Wandered up the road to an obscure, signal the driver bus stop that at least was on the right side of the road. Waited for 15 minutes for the 814 to show up. It was packed. It slowly wended it’s weary way through Devonport, got to Takapuna eventually. I didn’t have find a car park. Conclusion? 21st century PT ends at the ferry terminal. From downtown to Takapuna by ferry and bus was slow, infrequent and expensive. It was an adventure back to the 1990s. A wee bit off topic, but there is a wonderfully whimsical piece by Jarrod Gilbert in the Monday Column of this morning’s Herald which should interest readers of Greater Auckland. Jarrod informs us of the joys of discovering the addictive delights of actually travelling by bus. I like the New Network. It has convinced my daughter to learn to drive. Visiting her friend in Devonport from Greenhithe now takes 1hr 43 mins and three buses. By car it is 24 minutes. 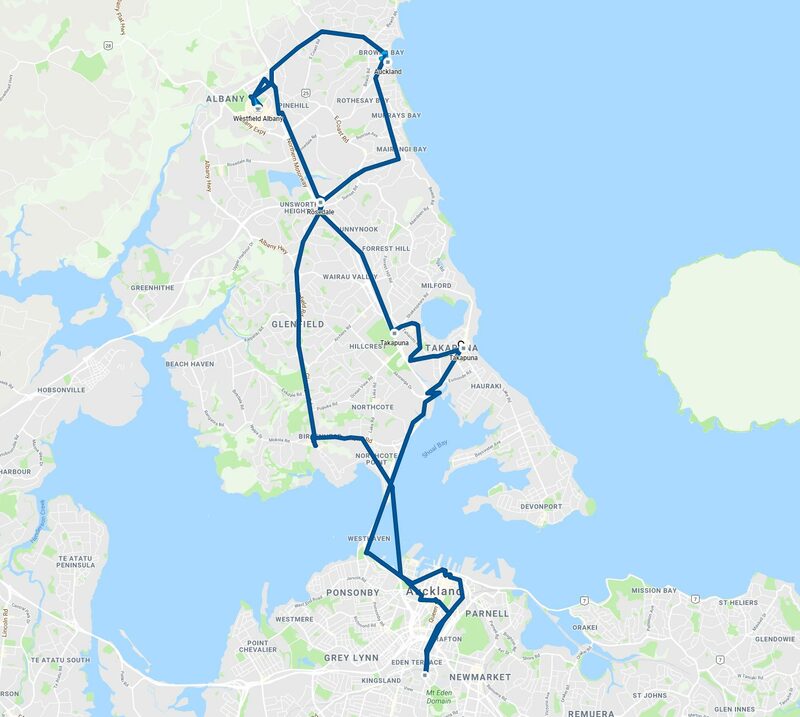 Was there previously a quality frequent bus connection between Greenhithe and Devonport that took less than 24 minutes? Miffy – When your daughter has learn’t to drive, will she use your car or her own (purchased out of her own money) car for the trip to Devonport? No, no and yes. She didn’t care about frequent as she didn’t make multiple trips there every day. But she could put up with 2 buses. I will probably buy car number 3 for the household. And yes it is one of those skills so you are not reliant on a public service that will one day let you down. Good luck waiting for a bus to come if the Auckland volcano erupts again. At that point you will need a car. So an unusual trip that was never quick has got worse, and someone has chosen to put up with petrol prices and drive. Sounds like the inevitable egg has been cracked to make the omelette. Having a car is only useful in a volcanic eruption if you can get to it and also the traffic isn’t so bad you can’t get anywhere. 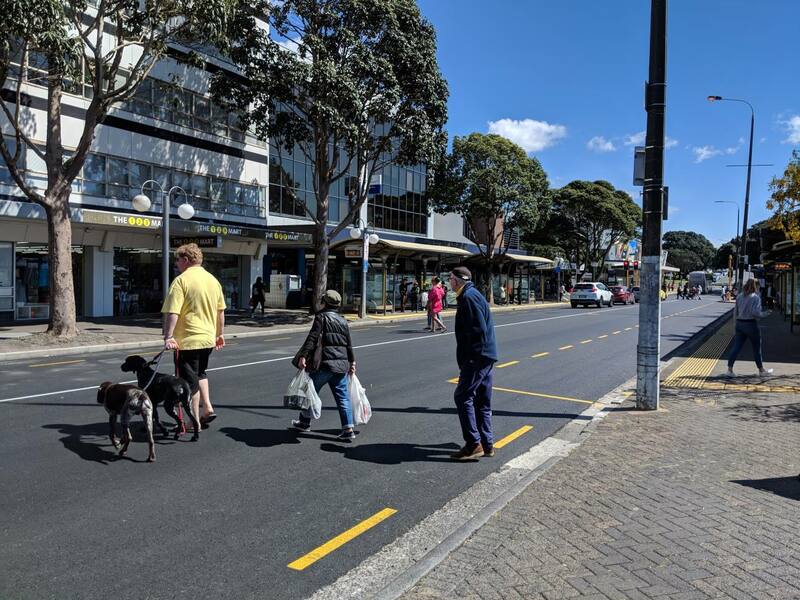 Devonport doesn’t have the reputation of being an easy place to drive. But buses also get stuck in that congestion. A long cross-town trip like that would always be very slow on a bus. Was her travel time much better on the old network? I guess the current journey would be 120 + any NX or 83, whichever comes first + 814 either in Takapuna or Akoranga. Would there ever be a long wait for that second leg? Shouldn’t this be a full time AT job – someone that just takes random journeys every day and reports issues? The right person could improve PT more than some 100 mil + projects will. I think that’s why a range of people read this blog, so that they can get a different perspective on the changes some sectors of the public would like. Agreed, it should be part of job description for the AT PT management staff. They need to experience it in person to understand the little issues that are frustrating and unintuitive. The data wouldn’t tell issues about usability and customer satisfaction. They could get some really good information from a team of mystery shoppers that do exactly what you say (if they don’t already). You could have different groups – experienced people looking for problems, and total noobs who they hand hop cards to and tell them to get to places. Actually, make them get the hop card themselves as part of it, see how long it adds to their first journey. Yes. 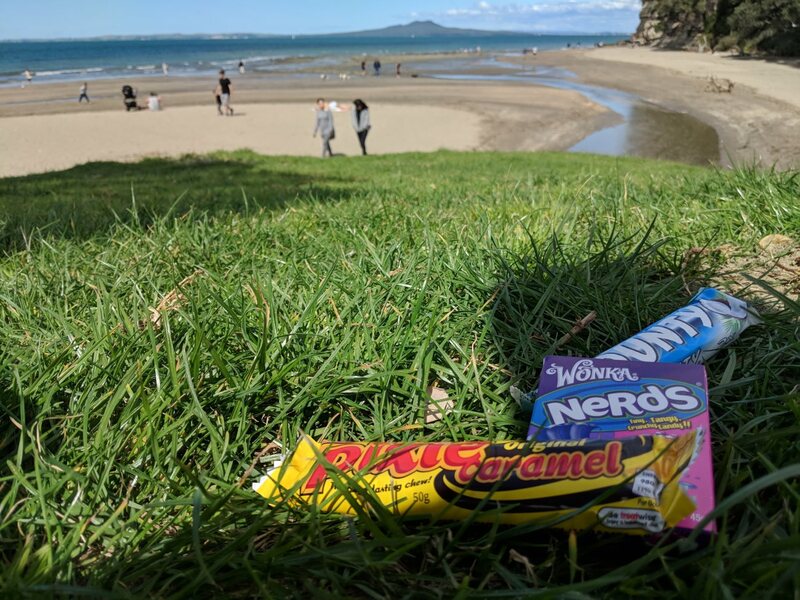 They could also get random visitors from outside Auckland who arrive by train or bus (at the Auckland Strand Station or the Intercity Terminal), and see how easy they find it to buy a HOP card and get started with Auckland’s PT. Maybe their out-of-town cards magically become HOP cards? Maybe their noses direct them to the off-site retailers who can sell them the card? Although in the case of the train arrivals, this is one uphill km away., and then to some information somewhere about which bus to take? Or maybe some magic fairy dust gets sprinkled on to help them avoid just hopping in a cab and becoming car dependent like everyone else. The missing Onewa road to NEX busway interchange is a missed opportunity. Definitely, Is there any agenda where this is being advanced? I agree. Currently the South Western suburbs are completely separate from the Eastern ones. The economies of scale that allow aspects such as greater frequency and greater diversity are not available without the extra stop. Interesting post thanks. 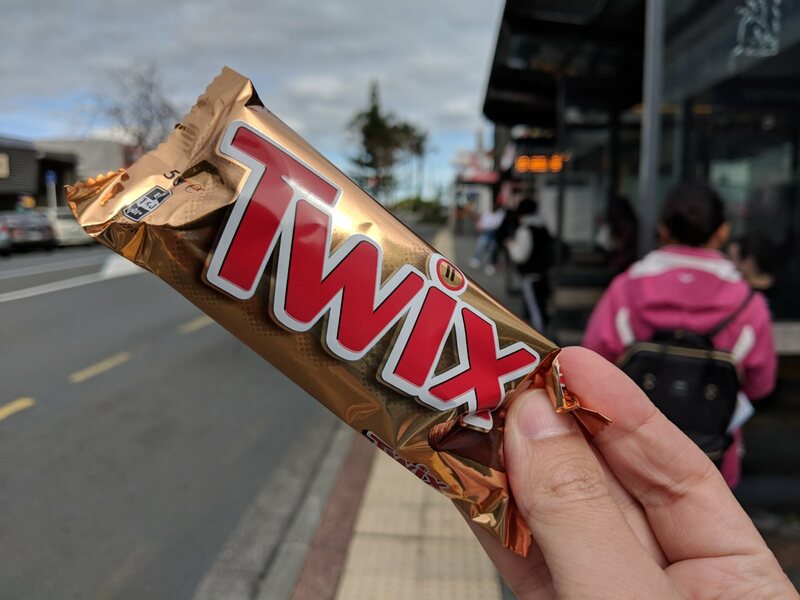 I did a trip to try it out Penrose-Britomart-Akoranga-Takapuna-Browns Bay & return. Noted that most the local buses were pretty cruddy & jerky driving and/or the hills going around to Browns Bay made it a wild ride. 856 bus around 10:30am weekday from Browns Bay to Smales Farm was pretty busy, with a variety of passengers, was a bit small though. – could do with a 20 min frequency interpeak perhaps. I often found out in a causal user perspective, the way finding and transfer information is not intuitive. It requires a lot of brain power and time to study the route in order to use it correctly. It should be designed in a way that a average person can understand and use it straight away without much study. 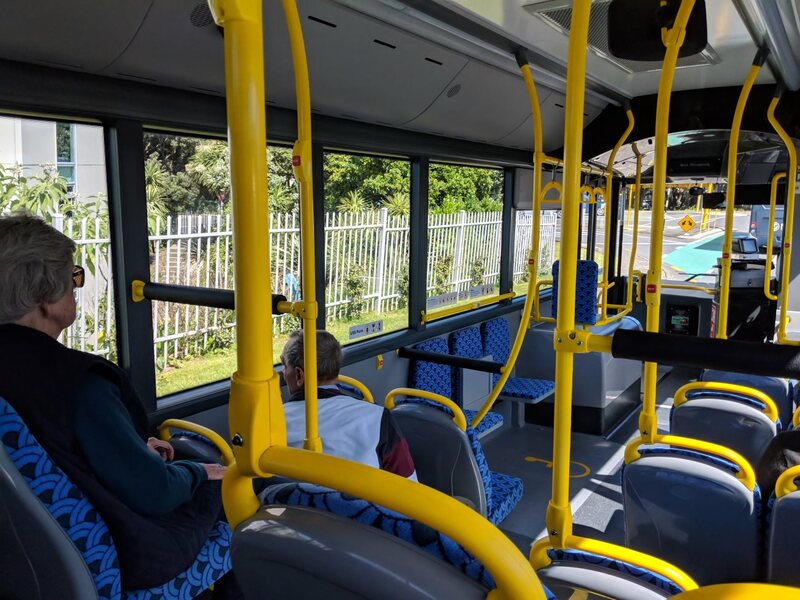 – We have different maps for different part of Auckland and routes. 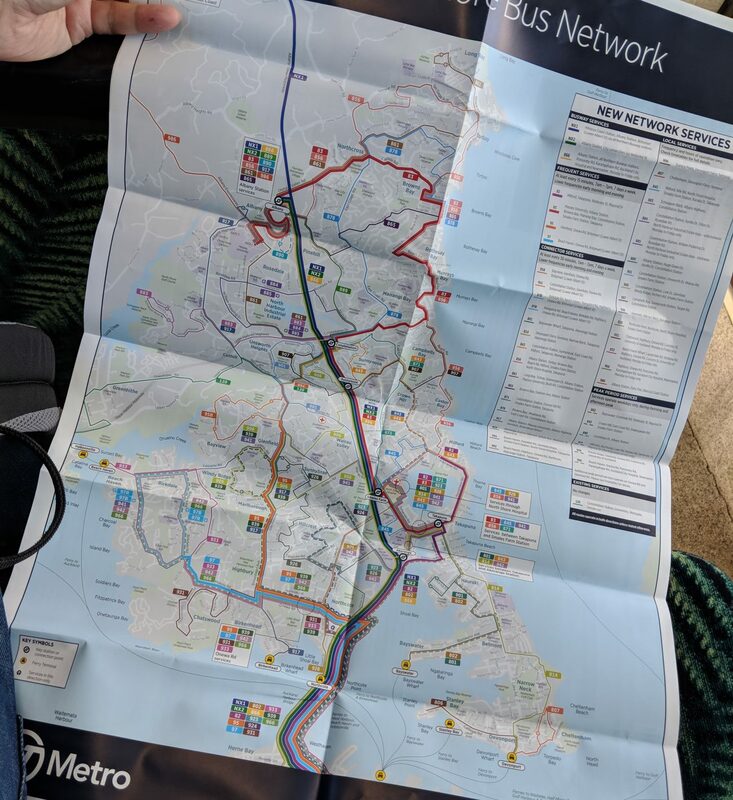 If I need to transfer between northshore and central Auckland, I will need to read at least two maps (sometimes more) and that takes too much effort and can get confusing. The bus stop doesn’t shows the maps in other parts of Auckland. So it could be difficult for inter suburb journeys. 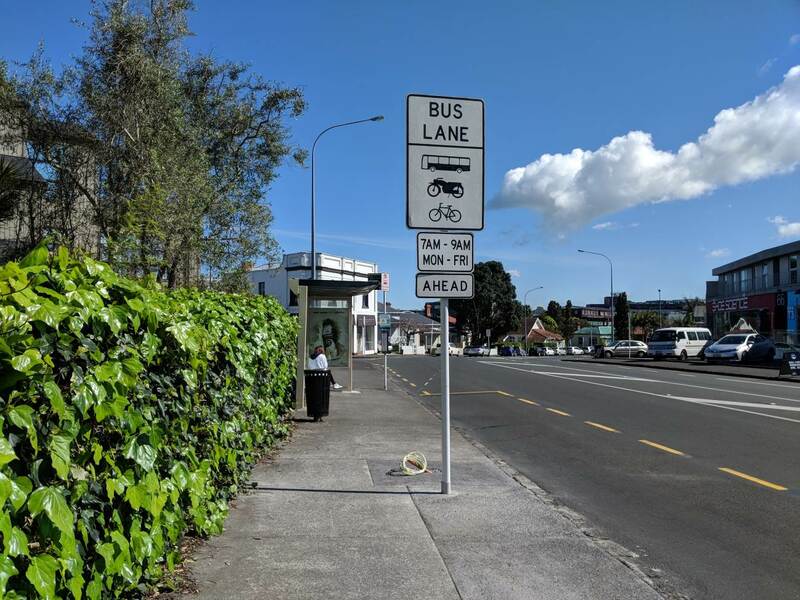 – Where is the bus stop for my bus – sometimes it can be confusing as the same bus route could use different bus stop depending on the direction and dropoff / loading. For example we have 4 bus stops – one for inbound loading, inbound drop off, outbound loading, outbound dropoff. It can be complex and we should consolidate. – When I am inside the bus, where do I hop off to transfer? There is a lacking of onboard information like speech announcement or screen to tell me where to get off to transfer, and how to transfer. – The ferry to bus transfer is a joke. It is expensive, and the timing is out of sync. – For the casual user perspective, the bus stops in city are all over the place, it is very difficult and should be simplified. The NX2 should continue to Grafton and the Hospital. It replaced the 881 which was often full of people who worked at the hospital. Now the 866 which goes via Ponsonby is much slower and more useless. I wondered this too. Maybe all NX2 services could terminate at constellation (rather than some extending to albany) and extend the southern end to newmarket as you suggest. Would seem to reduce duplication between nx1 and nx2? NX2 needs to start at Silverdale. My journey to mid town now has 3 buses as I have to transfer now from NX1 to NX2 but I used to be able to catch 1 bus all the way to mid town. 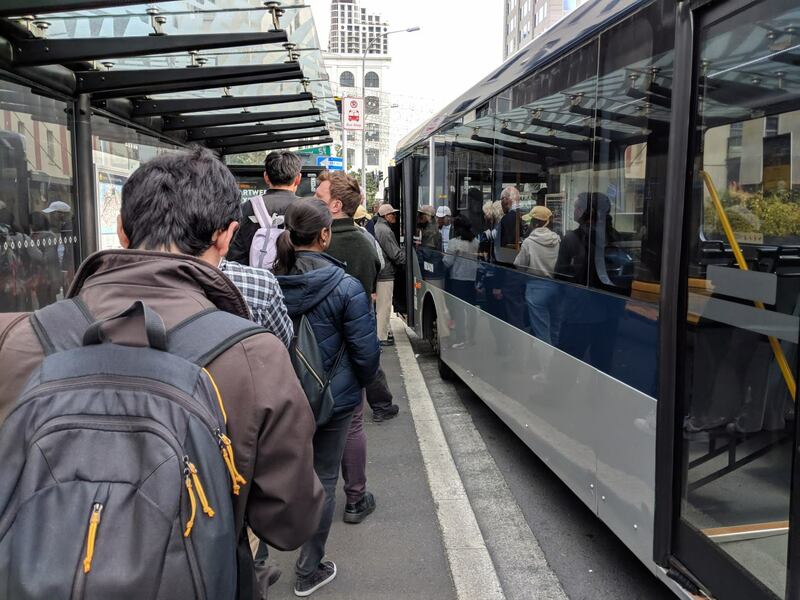 There are a ton of buses from Grafton that travel down Symonds Street, it’s an easy connection onto the NX2 on Symonds Street. Not really. Pre-new network there was a lot of buses that could go from Symonds St to Grafton. Now, it’s only the 75 and the 70. The 75 has a 10-15 minute frequency and the 70 has an 8-10 minute frequency. Combined, it would give you a 5 minute frequency. BUT the problem is the timing of 70 and 75. They are timed so they often arrive at each stop within 1 minute of each other. Which means you either get a bus or you don’t. I actually think the NX2 should terminate at the Sky Tower. Going past that is sloooooow – probably worse than the 866. From Fanshawe to Auckland University via Wellesley took 20, 21 and 19 minutes last week (and now a longer walk, since it goes to AUT, not UoA (thanks vice chancellor… grrr). But on Thursday/Friday, I re-created the old 881 route (NX1 -> 93x, transferring at Fanshawe). Including the wait for the 93x, Fanshawe to Auckland University was 11 and 10 minutes on Thursday/Friday. For Newmarket, there’s one more change, but I reckon a re-created 881 will be faster than the 866. Change at the bottom of Anzac St for the 70/75. A bus direct from the hospital to the Northern busway would be popular. I was involved with promoting the 881 but one aspect I never got was buses after 6 pm . I think these would be popular as health staff are notorious for working over time. I will leave the bus city route discussion for those with recent experience. I would recommend it goes to Albany however terminating at Constellation would add to Congestion when a number of people wold gave to then get on a bus to Albany. This would be fine when it is quite but when it is busy the time re boarding will add to congestion. I am a previous user of the 822 from Castor Bay to Takapuna. In the mornings the 822 left once every 30mins, and took 8-12 minutes usually . 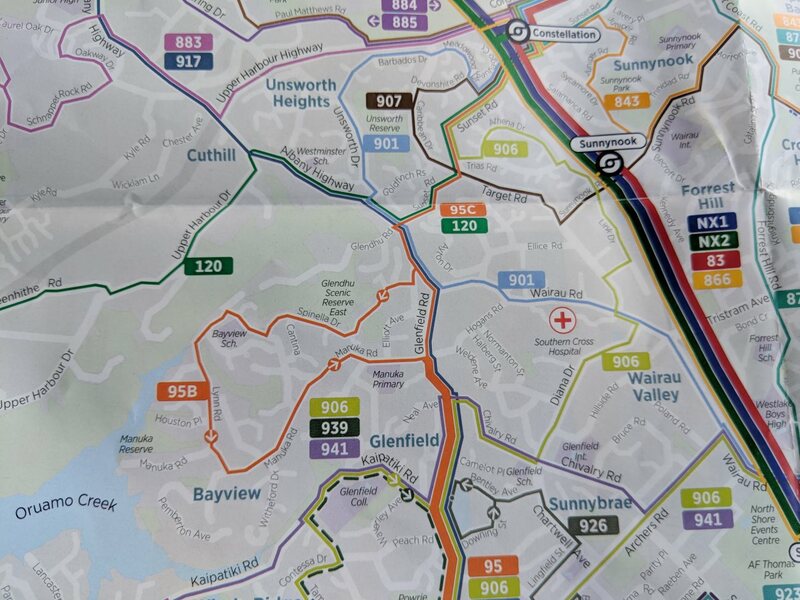 Now I can take the 856 bus but still it comes only every 30mins (still, because only every second 856 bus actually goes to Taka, the others terminate at Smales) and yet it takes 20-25 minutes as you have take the dog leg through Smales and the hospital etc. Or I can take 2 buses, the 856 to Milford then the 82 which is pretty ridiculous, or drive the car to Milford and then take the 82. I am erring towards the last option… Not a great outcome for me, at least, and I suspect many others who actually don’t want to go to the CBD every day. Doesn’t help you now but i’ve often wondered about a new cross town frequent running murrays bay to milford/takapuna via beach road and then to birkenhead via akoranga and northcote. 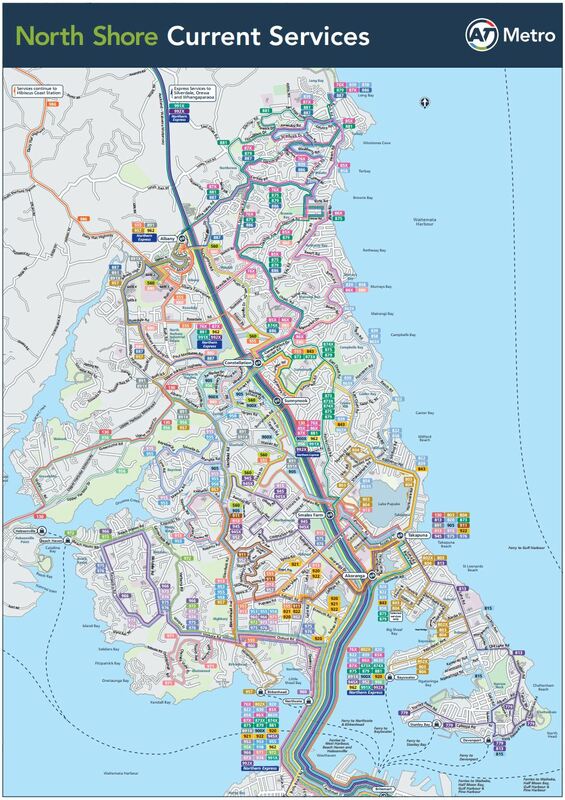 Even without an onewa road interchange i do think the NN on the North shore would be improved with better east west connections. Yes. And attending to this would be a first step to meeting one of the top-ranked goals in the GPS, ‘access’, for anyone on the north shore not doing a typical commute over the bridge. 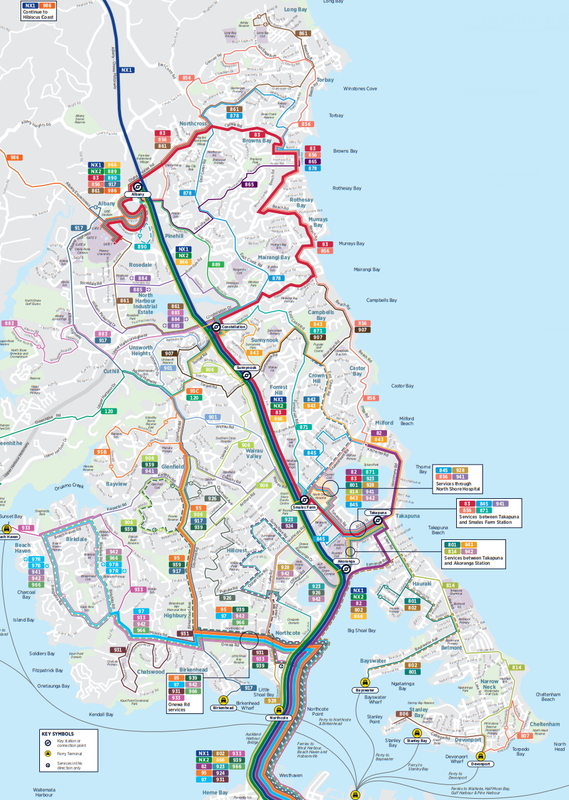 If the north shore gets the concentrated network of buslanes that it needs, hopefully AT will add some East-West routes with good transfers then. Yes that actually sounds like a good idea. Surely it’s now time for Onewa / Bottom of the bridge station. Then you just need a single set of services from different parts of town along the busway. Then it will be an actual ‘node network’. Also, designing Akoranga station as mentioned in this article to not be feeder for the Takapuna area is poor form. Also, does anyone else think the feeder buses to the bus stations doing their loops through the station itself is a poor design? I’ve only caught a feeder bus to Smales so far, but they have to drive in, give way to the thousands of NX1’s and NX2’s to come speeding in in rush hour, go through the station, and back out to let you off. If you compare this to the services that would come into the station and then just continue into town, wait times pile up. I personally think all bus stations should have been designed like many train stations – with a big platform in the middle that you climb in and out of with feeder platforms existing separately from this main platform. However, then the buses would require doors on the wrong side of the bus. But ideally since the only buses running down the busway are your NX1’s and NX2’s, a design of bus with a door on the drivers side may work. Or, a more ridiculous solution, the buses run American style and drive on the right. But off topic: The author seems to be a fan of bad food LOL…. Yes, this is incredible. AT have the Healthy Streets information. They know lack of pedestrian amenity results in a physically inactive population and is a leading cause of early death and illness. Do the health boards need to take a court case against AT to get them to act responsibly?